And, I say that in good Christian charity, as always. Big Nanny claims to know what you should eat. The US Federal Government needs to feel like they own your spoon and fork. Why? Has it come to this? Have they nothing better to do? What happened to all those Pharaohs in the pyramids? Answer: They died and were wrapped in bandages. Think about that please. One of the most deadly places to find propaganda and heresy is on the back of your cold cereal box. The kids will read it every time since they are right there eating the insipid rubbish from the inside. It is interesting to consider the theological origins of cold cereal. Mr. Kellogg, of Battle Creek, Michigan, was a Seventh Day Adventist, and his zeal for corn flakes was motivated by the heretical Hindu conviction that eating meat was evil. Of course, God commands us to eat meat in Genesis 9, and Jesus Christ certainly ate meat and even cooked it. I find it instructional that Mr. Kellogg is listed as a great New Ager in the New Age Almanac. Most of these cold cereals these days have more food value in the box than in the alleged food inside. So, on the back of your cereal box will appear a pyramid of the food chain. The old food chain went away, and the New World Order food chain came along. 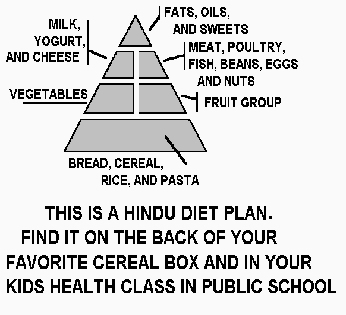 This pyramid again follows the Hindu logic that meat is evil and carbohydrates are heavenly. Nothing could be further from the truth. 1. The kid will get fat early. Carbohydrates, like starch fried in oil, ARE addictive. Now THAT is "substance abuse." 2. The kid will become anemic from avoiding meat which is a high iron provider. Note the pallor of death in the face of a "corn fed" french fried kid. 3. The kid will grow up to have clogged arteries. How do hogs and cattle get loaded with fat-- From eating meat and fat? NO-- They get fat from eating CORN-- carbohydrates. Please read that again groupies. 4. The kid has a much higher risk of diabetes from the carbos he is eating all his growing up years. No one ever got diabetes from eating a fat and protein rich diet. 5. The kid will not do well at school since his mind will be put to sleep by carbohydrates. THAT is s a fact. Also, a couple of amino acids ONLY found in red meat will be absent as the kid's brain develops. Duuuuuuuuuuh! 6. This kid has a much greater chance of getting allergies, from grains and other sources, than his friend the meat eater. My brother in law has had problems with diabetes, clogged plumbing (arteries), and weight control. He recently went on a diet which I thought sounded like a sure way to commit suicide. He eats all the red meat, fat, and grease he wants, along with milk and cheese, and of course vegies to the max. BUT, carbohydrates are OUT. He can eat a Ritz cracker about once a week I think. He even watches carbohydrates in certain vegetables. Guess what? He is now slim and trim, no sugar problems anymore, and he is tearing around like he never had a heart attack and two angioplasties (Sp?). 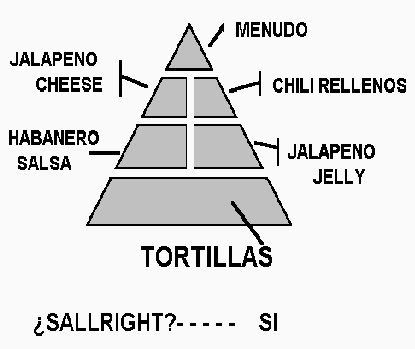 DEAR ANGLO FRIEND: Here is the pyramid you will like my friend. It has all the prospects of changing life for all those brave souls who know the true riches of good food. 1. Lay a tortilla on the plate. Make sure it is the kind made with lard, like in Sonora, Mexico. Mmmmmmmmm! When those little Nanas make those tortillas, they work the dough with their hands until the thing is about 18 inches in diameter, then they move to their arms, and the thing gets to be 24 inches in diameter. 2. On top of the tortilla, see how much of the other ingredients you can pile up without the thing running off the plate. If you cannot handle Menudo (I pity you), then try Chorizo or beef fajitas with sauteed green New Mexico chilies. 3. Carry it all carefully to the convection oven, and heat it until the cheese starts to bubble. 4. Eat this in a leisurely manner and go take a siesta. May you live many long and happy years, Amigo. Answer-- You will not be eating against God's order. Red meat and vegetables are the ONLY things God told man to eat. Vegies to Adam, and meat to Noah. You sure cannot say that we pull the party line here, right? Also, we want you to be able to enjoy a big steak without guilt. Let Big Al Gore and Shirley Mc Laine eat the seaweed. Let us Bible believers eat well and live longer. They got self-conscious about all the fat Americans and made a new pyramid. The carbs were reduced, but they are still dominating, and protein and fat are upside down. And, the feds, with the help of Emmanuel Rahm's little brother at the National Institute of Health came up with the nutrician plate. Notice please that there is NO fat in this diet. They are insane. You can thank Obama for this trick to make you crave even more carbs.